Originally created for herding sheep, the German Shepherd breed (also called Alsatian or Alsation) is an amazingly versatile dog. They epitomize intelligence, strength and obedience. A working dog, their potential ferociousness makes them well suited for police and military roles. But, their loyalty and protectiveness also make them great family companions. It all started in 1889 at a dog show in Karlsrühe, Germany. 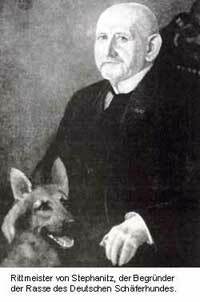 Captain Max von Stephanitz saw a medium size wolf-like dog, yellow and gray in color. The dog was graceful and powerful, and embodied endurance along with intelligence. A working sheep herder, the dog was born with natural ability and required little direction. Hektor Linksrhein, was purchased by Captain von Stephanitz and later renamed Horand von Grafrath. 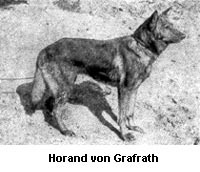 Horand became the first registered German Shepherd Dog. The German Shepherd breed standard was based on mental stability and utility. The Captain believed that beauty was secondary. He thought a dog should have strong intelligence but was worthless without the proper utility and temperament to make it a good servant of man. The breeding blueprint contained structure, gait and inherent attitude. Though the Captain did not place a high value on beauty, a German Shepherd is one of the best looking dogs out there. They have a strong chest with a slightly elongated body. Sturdy and muscular with a light but solid bone structure. Their front legs and shoulders are muscular with thighs that are thick and sturdy. Their feet are somewhat rounded with very hard soles. The coat can be either rough-coated, long rough-coated or long-haired. Their coat color is most often black and tan, sable or all black. Solid black German Shepherds are a striking sight. They can also be blue, liver and white, although those colors are considered a fault, according to breed standards. White German Shepherd dogs are not recognized by the AKC, but are now considered a separate breed called the American White Shepherd. Their head is in proportion to their body with a forehead that is rounded slightly outward. Wide at the base, their ears are upright, pointed and turned forward. Until about six months, the ears of puppies may droop slightly. Their noses are most often black, but can also be blue or liver. This is considered a fault for showing purposes. Eyes are dark and almond shaped, with an intelligent and lively expression. A bushy tail reaches almost down to its hocks and hangs down when the dog is at rest. Their age expectancy is around 10-13 years. German Shepherds grow fairly quickly. Check your pups progress with the German Shepherd Growth Chart. These dogs love to be close to their families. They have a strong protective instinct and are very wary of strangers. At just 18 weeks old, my GSD puppy barked at strangers approaching me or "her yard." This protective nature requires extensive socialization. Obedience training from an early age is an absolute must. Strictly positive reinforcement should be used. 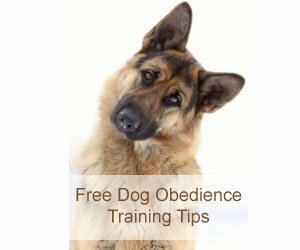 Angry or coercive training does not work well with these dogs, and may backfire. It is highly important to obtain your German Shepherd from a reputable breeder. Do not visit a backyard breeder. They lack the knowledge and expertise it requires to breed a quality German Shepherd. As a result, they typically create dogs that are timid, skittish and prone to fear biting. To be truly happy, the German Shepherd needs a task in life. They are extremely intelligent and learn very quickly. Their talent has been used as sheepdogs, guard dogs, K9 police dogs, guide for the blind, for search and rescue, and as dogs in the military. And they can learn just about anything you want to teach them. Despite being the second most popular breed inthe country, German Shepherd dog puppies are not a common sight in my area. A simple visit to PetSmart or the local dog-friendly mall creates quite a stir. It seems that everyone wants to meet a GSD puppy. On a recent visit to the mall, two shopworkers high-fived each other after we entered their store before pausing outside. At an agility demonstration, a lady was overheard saying that she just had to meet the German Shepherd puppy. Thinking of Getting a German Shepherd Dog Puppy? Avoid Pet Stores. Most reputable breeders will not sell their pups to pet shops. Many of these puppies come from puppy mills. Stay away from backyard breeders as well. These breeders contribute to the pet overpopulation problem. Due to this irresponsible breeding, many of these beautiful dogs become abandoned or wind up in shelters. Check our tips for finding a quality german shepherd breeder here. 25% of all dogs that end up in the shelter are purebred. In your search for a GSD, please check with your local shelter, humane society, or German Shepherd Rescue group. I would highly advise you to ensure your housing situation is stable before obtaining a German Shepherd. Should you have to move unexpectedly, you may end up losing your best friend. Many landlords do not allow large dogs such as German Shepherds. And some insurance companies will charge higher rates, or may not insure you at all.